Study identifies gene variants in inflammatory bowel disease under Age 5. Inflammatory bowel disease (IBD) is a painful, chronic inflammation of the gastrointestinal tract, affecting roughly two million children and adults in the U.S. Inflammatory bowel disease (IBD) beginning in childhood tends to be more severe than adult-onset disease. In fact, very early-onset IBD (VEO-IBD), diagnosed under age five, is often more severe than IBD that starts later in childhood, and often more challenging to treat. 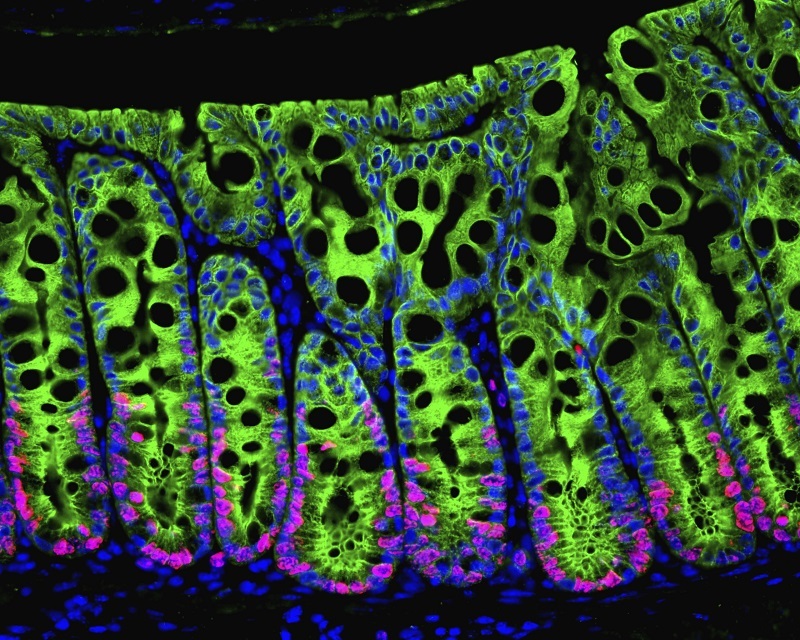 Extensive research has been performed in the genes contributing to adult-onset IBD and in children aged 10 and older, however, relatively little research has been performed in the very-early onset subtype of the disease. Now, a study from researchers at The Children’s Hospital of Philadelphia (CHOP) analyzing the complicated genetic influences in inflammatory bowel disease have discovered new gene variants associated with an often-severe type of the disease that affects children under age five. The team state that the genes play important roles in immune function, and that knowledge helps guide more precise, individualized treatments for very young patients. Previous studies show that the cause of the inflammatory bowel diseases (IBD) is not known. However, there is good evidence to suggest that these diseases are due to a combination of factors, including genetic predisposition, environmental factors, and alterations in the function of the immune system. There is strong evidence to suggest a genetic basis for IBD, including familial clustering and racial and ethnic differences in risk for IBD. The first gene associated with Crohn’s disease, the NOD2 gene, has been identified in earlier studies. The lab note that other studies have relied on genome-wide association studies (GWAS), which often do not find rare gene variants. The new study uses newer technology, whole exome sequencing, which has revolutionized the ability to study rare gene variants. The group also state that previous studies did not investigate children under 10. The current study analyzed DNA from 125 children with VEO-IBD, all of them under age four, along with DNA from 19 of their parents. A control group of 210 subjects included 145 healthy individuals, 45 patients with pediatric IBD and 20 with adult-onset Crohn’s disease (one of the two major types of IBD). The researchers note that because IBD is a complex disease, in which a patient’s genes may alter immune response to environmental exposure, the researchers focused on specific genes or biological pathways associated with primary immunodeficiency disorders. Results showed rare and novel variants in genes that regulate B-cells and T-cells–immune cells with important roles in immunodeficiency disorders. They also showed rare variants in the IL10RA gene, a member of a key immune function pathway. The data findings reinforce other research that has revealed considerable overlap among genes involved in different immune-related diseases. The team hypothesize that this overlap is reflected in the fact that VEO-IBD may be a form of primary immunodeficiency. They go on to conclude that evaluation and treatment guidelines are not yet standardized for children with very early-onset IBD, however, their study has found that this subtype of IBD is somewhat different from IBD that begins later. The team surmise that for health providers caring for children with VEO-IBD the research underlines the importance of doing complete immunological workups for these patients, in addition to IBD evaluations. They go on to add the a genetic workup may also be necessary. For the future the lab expect further whole-exome studies to identify additional immune-related gene variants and pathways. Understanding the Biology and Genetics of IBD. Copyright © 2014. The Leona M. and Harry B. Helmsley Charitable Trust.